This new book should be on you shelves, especially if you collect Elvis Picture books, and even if you don't as here we are treated to the inside world of Elvis during one of his unusual stints in Vegas during August/September 1973. Introduction by Glen D Hardin, who gives a brief description of Elvis mood & humour during this engagement in Vegas. A Foreward by Arjan Deelen who enplains how he came up with the idea for the book and how he tracked down the photographer and put the idea to him for the book, which captures one Vegas Season in Las Vegas that has become legendary for many reasons. 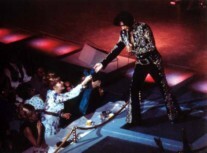 This is followed by a well documented story of how Laurens van Houten, joined the Dutch fan clubs trip to the USA to see Elvis in concert during the latter part of his summer season in Las Vegas, and how he was commissioned to go and photograph Elvis on stage. No easy task in those days especially in Vegas. There are some candid photographs at Graceland before they flew out to Vegas, they even got filmed for a Local Memphis TV station. 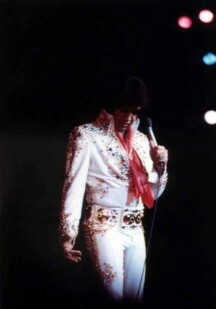 What makes this book stand out from the hundreds of books on Elvis, especially the photograph books is that most of the pictures are in colour, granted most may not be the sharpest in the world but they certainly capture Elvis on stage well. 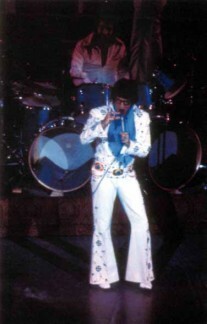 Also most have captions from Elvis' band mates reminiscing on the fun times they had on stage. Elvis was the kind of guy that needed new things. He needed to be inspired about certain things. And I personally feel that management was not doing that for him. I personally feel that at that point of his life he should have travelled. He should have gone all over Europe, he should have gone to Asia, he should have gone around the world. No other artist in our time could have gone every place he could have gone. There's no place that wouldn't have welcomed him. Even in the remote parts of Russia I think they know Elvis Presley! Just think about that. And I think deep down he knew that, and that was part of his frustration. He was very easy to sit down and talk to, and we'd talk just about everything in the world. He was a very good listener. He loved to tell stories, he loved to hear stories, he just loved to hang out with the boys and have a real good time. He felt real comfortable once we got behind closed doors, lock the door, nobody's coming in. we were all lil' Southern boys, you know, so we could just be ourselves. Laugh and have a great time. This is a great book to flick through while listening to one of the shows from the latter part of this engagement in Vegas. Elvis was in fine form even if he wasn't happy with the way his life was going, he went out to have fun and nobody was going to stop him. A lot of work has gone into this book and it shows, you won't be disappointed in it.